How to add meta tag in blogger. Yes! in this posts i will share a complete pack of Blogger SEO meta tags. As you all know that Blogspot is a most popular and easy CMS blogging platform. Search engine optimization is most important part in blogger also. A user and Search engine got a brief idea from title tag of your page/posts and it is must important. We put <title> tag after <head> tag. This title tag display on browser's title bar and Search result. If you running a blogspot blog, then you must need to SEO Optimize for your blog. SEO for blogger is most important part for every blogger. In this post i shared a complete SEO pack for blogger. A blog's must need to add different tilte tag in different pages or posts. Using this all in one seo pack for blogger, you can also add keywords meta tag in your blog , that will make search bots understand about your blog. Blogger keywords meta tags summarize your blog to search bots that, what about your blog. Description meta tag is also important for blogger. 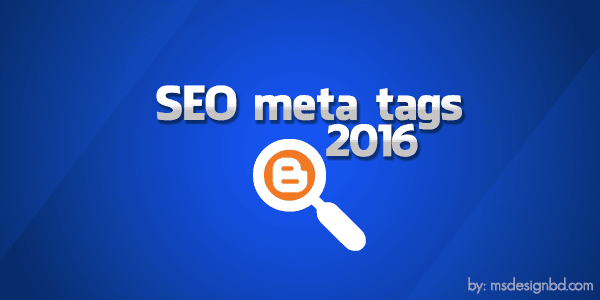 Description meta tag provide a summary of your page or posts on search result. That is most important for indexing your posts on search engines. Title meta tag and description meta tag is most important for blogger seo. Blogger meta description tag is <meta name=”description” content="XXXX”> this is meta tag description for blogger and it also to place after <head> like title tag. Don't worry. In below i will describing to you, how to add meta tags in blogger. All in one SEO pack 2016 for blogger may help you for better search results. Meta tags for blogger is essential for your blog's everything. Blogger meta tags will help you for better search results for various search engine. In this post i shared a complete pack of SEO meta tags. That help you a lot. Around internet, you also find meta tag analyzer, but it will be not complate for you blog. You must need a complete blogger seo optimization. Today i share full meta tags of search engine optimization. SEO friendly blogger themes also play an important role in search results. Optimized posts title: Show posts title first on search results. Optimized blogger comments: Help search bots to crawling blog's comment. Finally it done. If you found any problems, then feel free to inform me on comment section. Subscribe Now for our all latest updates and free blogger templates. If you think our posts are helpful, then do not forget to share our posts with your friends because your support is our future. Thanks and happy blogging. How to copy this code?? plz place it in a textarea or upload a txt format file, so that we can place it accurately. can you translate widget on your web site. Because i'm Turk and some times i'm not traslated yor write. Thank you very much. Your article is always hit like previous. God job here. I have a question though. My blog has 3 authors, so how do it over here. This seems to be for just one author. Are you kidding me? Haha thanks! After all it's a great post. bro not need to use this meta tag?? Everything is okay. You should need be more specific what problems are you facing!! Vai amr templater shate j tag cilo seta delete kore ei tag gula dici ...kono prb hobe ki? Na, Kuno problem hobe na. Thanks for sharing this nice meta tag for blogger. vai eta ki shudhu blogger er jonno? naki wordpeess e use kora jabe? Label Name type korlei hobe. Amar blog e language 2 ta Bangla and English ta hola ke 2ta language ke add korta hoba. thanks for sharing..very helpful for others. With increased competition, constantly changing algorithms and search engine rules, Search Engine Optimization (SEO) now requires much higher expertise to handle it. Having realized this fact, many marketing companies like web developers, PR firms, web hosting companies, etc. - all which used to carry out their clients SEO processes (along with their specialized services) by themselves, now agree that Trust flow blog comments is a process that is better left to the specialists in the industry, thus, relieving the burden off their shoulders. This has given rise to SEO reselling.